Zucchini Soba Bowl with Tahini Sauce | Naturally.Zucchini Soba Bowl with Tahini Sauce | Naturally. A perfect summer noodle bowl that only requires cooking the noodles and comes together in about 15 minutes. Cook the soba noodles according to the package. 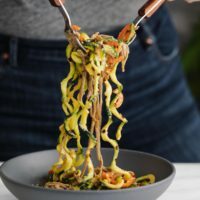 Spiralize or thinly shave the zucchini and carrots. Place in a bowl along with the cooked noodles, reserving some of the noodle water for the sauce. In a separate bowl, whisk together the ingredients for the sauce. Add enough water to thin the sauce so that it will coat the noodles. Tips + Tricks: If you don’t have a spiralizer, use a vegetable peeler to make think strips.